I knew it all... the style of my dress, the color of my bouquet, the color of my bridesmaids' dresses, the flowers... I had it all planned out. But what I couldn't wait for the most was to use that registry gun and shoot every object that I could ever wish for. However, once I was engaged and was actually planning a wedding and not just dreaming of it, it was pretty stressful and overwhelming. What was nice was that when it came to registering my husband pretty much left it all up to me! Registering can be a lot of fun but I wish I knew then what I know now, like which items are better items to register for. I registered for many pots but I still feel like I never have the right ones, the one type of pot I really want and still don't have is a cast iron pot. I wish I registered for more than one because they would really come in handy when cooking. The Martha Stewart Collection at Macy's has such great cast iron pots with amazing reviews, so those are next for my home purchase. But let's get back to my recent purchase... When it came to bedding, we actually got ours custom made and we weren't happy... biggest waste of money. I've tried different types and never found ones that I loved. 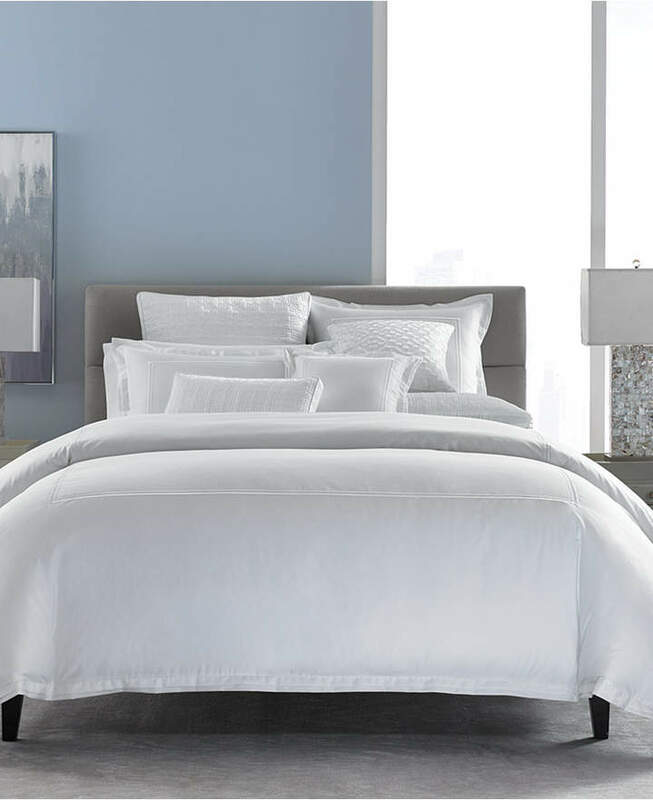 I recently purchased this luxe white bedding from Hotel Collection which I'm obsessed with! It feels like silk and looks amazing. I don't know about you, but for me, my bed is not just where I sleep, it's also where I hang out and even do some of my work. If you are registering or even looking to purchase new bedding, the Hotel Collection has amazing choices with all different styles. I debated buying these or the greek key style but I decided to go with all white that has nice detailing because since I have a toddler I wanted to know that if need be I can bleach it. If you're a bride and are feeling overwhelmed with the choices of places to register Macy's has amazing items. We registered at Macy's for tableware, towels and much more.. the only other thing I wish I registered for, aside for cast irons pots, was bedding. If you're registering don't just stop at bedding... When I registered I never thought to register for furniture, but why not? Items may be pricey but you never know what you'll get ;) We bought our mattresses, dining room table, and other furniture at Macy's. We have Beautyrest mattresses. There are many different styles to choose from but they are so comfortable and great quality. If you're not a bride and you're just looking to spruce up your home, like I always am, definitely check out Macy's home products. You can see more of my home picks below, I hope they help you complete your registry or fill the needs in your home!